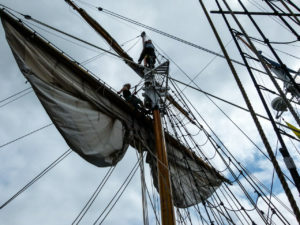 Climbing about the rigging, agile as squirrels. I’m a sucker for sailing ships. Not puny yachts and weekend sailboats, but the real thing. Mighty ships from another era with masts and sails that dare the deeps before the wind and storm. 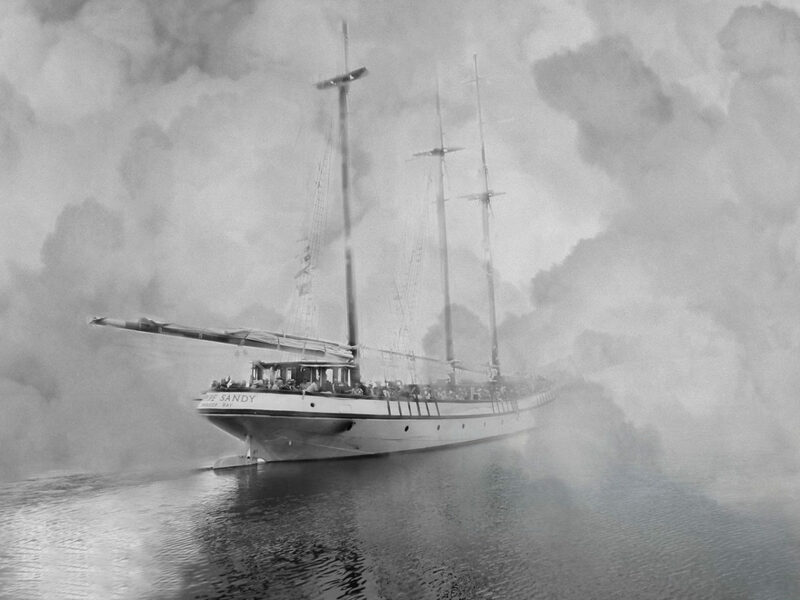 So when the tall ships stopped at the nearby town of Bath, I was right there to swarm aboard and pretend I was Jane Tar. 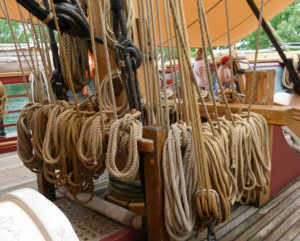 Only a fraction of the complicated ropes everywhere on a sailing vessel. One thing you don’t realize until you get up close is that these ships are big. A great mass sitting in the water of planking, hatches, towering masts and furled sails. You can get a little seasick just from touring them at the dock. How, you wonder, do they ever control all this out on the open sea? 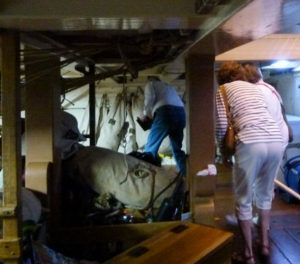 Below decks, bend over and watch your skull. The country’s tallest ship was there, the Empire Sandy, which slipped off to thrill a crowd of passengers with a three hour cruise. On the practically windless day, the sails were set to give them their money’s worth. Dozens of eager faces grinned over the rail, dreaming they were pirates. At the dock, I toured a replica Great Lakes schooner which the captain told me had to be reproduced by diving on wrecks to figure out how to put the gear together. The surprise was going below and discovering that the ship, below decks, could only navigated bent over or you risked your skull on a beam. How did they escape brain damage lurching about under here on a storm? A couple of soldiers from the war of 1812. The same with an even bigger ship, a black painted brigantine with masts thicker than a body and neck cramping space below. All the meals for the crew were cooked on a wood burning stove with the pipe thrusting up through the deck to let out the smoke. The stove top sported railing to keep the pots in place against the roll of the waves. Fire hazard was all I could think on a plunging ship wooden ship full of flammable help and tar. And ropes? Well, ropes were everywhere. Thick ones, thicker ones, coiled ones, stretched ones and spare ones. Very clear where the term “learning the ropes” came from. True sailors have to have enormous webs of rope inside their heads. Big and small, sail moves them all. A schooner features in my sequel to The Tomorrow Country, so the chance of a bit of research was terrific. I was free to imagine the howl of the wind and the plunge of the bow into smashing waves. Also to glimpse the discomfort and the danger. The romance of a sailing ship is alluring on paper, but not so much in the teeth of a gale with only your wits and a death grip on the wheel to keep you off the rocks. Who can forget the dramatic sinking of the HMS Bounty replica in Hurricane Sandy and the dangerous Coast Guard rescue operation that required. I enjoyed the eye-opening expedition into the bowels of vessels that are now mostly training boats and nostalgic curiosities. When I sail, I’ll choose a ship with a big engine and plenty of standing room below.